If you didn’t know who Emmylou Harris was, and you met her at a bar and asked her about what she did for a living, you probably wouldn’t believe a word she said. Right from the very beginning, and seemingly without even trying, her career has been all but mythological in its scope. Over the past 40 years, she’s sung with Gram Parsons, Neil Young, Bob Dylan, Dolly Parton, Mark Knopfler, Linda Ronstadt and Willie Nelson – just to name a few – while at the same time creating an impressive body of solo work that would be the envy of anyone in the business. Yet, none of this seems to have fazed her in the least, as Harris seems has avoided the temptations of stardom to focus on singing and playing some of the best country-influenced music being recorded today. Harris keeps it simple on her 25th solo album, Hard Bargain. It is a stripped-down, intimate affair that relies on trust and intuition as much as it does on hard work and professionalism. With producer Jay Joyce on guitar and Giles Reaves on piano and percussion, Hard Bargain is an example of world-class woodshedding and features log cabin music of the highest order. As ever, the spotlight is on Harris’ still -transcendent voice. The years haven’t diminished the purity of her vocals, and the few rough edges that can be heard from time to time only add to the appeal as her voice covers these songs like a worn-in favorite pair of old jeans. After spending her career as a first-rate interpreter of other people’s songs, in recent years, Harris has begun to tell her own stories and trust her raconteur’s voice. Of the 13 songs on this disc, 11 of them are originals, and for the most part they come off as very solid and true. 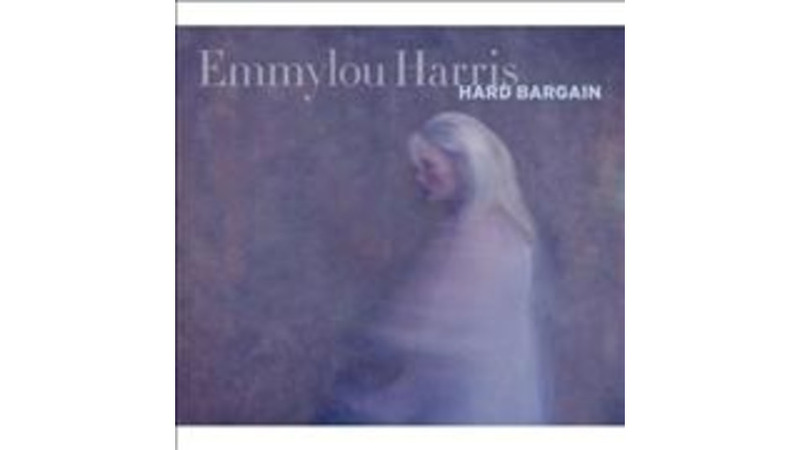 Beginning with “The Road” – a song that recalls Harris’ formative musical and personal relationship with Gram Parsons – Hard Bargain is an album of songs that illuminates the singer’s place in time and the events that have brought her to where she is. Looking back over the years, she sings “I can still remember every song you played” as she still continues to carry a musical torch for Parsons that can be heard in many of these songs. The reaching back in this track is bookended by a more recent loss described in “Darling Kate” – a tribute to her old friend and collaborator, Kate McGarrigle. It is a lovely and poignant eulogy that avoids being maudlin and strengthens the emotional truth of the other songs on the album that all concern themselves with life’s many challenges and pitfalls. As much as anything else, Hard Bargain is an album of reminiscences that is both personal and universal. In songs like “The Ship On His Arm” the listener hears Harris coming to terms with her past, the places she’s stood and the people who have been important to her as she defines her place in the here and now. “Goodnight Old World” is a perfect example of this that explores the perspective a new grandchild imposes upon us as the years go by. Even on “My Name is Emmett Till” her account of the 1955 murder of a black teenaged boy in Mississippi, a subtly inferred moral obligation to keep this story alive for people who may have forgotten it weaves the song into the greater context of the album. The truth of Harris’ words compliment the rage and disgust of Dylan’s “Death of Emmett Till” from 1962 by imbuing the lyrics with the wisdom gained from living and travelling through the disparate Americas that have risen and fallen over the last five decades. At 64 years of age, Emmylou Harris has had one of the most consistent careers in music and could certainly be forgiven if she decided to slow down and rest on her laurels. But, this absolutely isn’t the case with Hard Bargain. A solidly sung, played and written collection of songs, it is a very fine release that will almost certainly find a welcome reception from her longtime fans.